Blow to the head by a falling object or in an assault. Child abuse, like shaking a child, can cause this type of injury as well as in more serious injuries to the child's brain or spinal cord. Muscle relaxing medications like carisoprodol, chlorzoxazone, methocarbamol, diazepam ease muscle spasm and can relieve pain, but these medications can make a patient drowsy. Physical therapy: This helps to wean a patient from a cervical collar, strengthens muscles and reduces pain on movement of neck. Cervical collar: Soft cervical collar is often given in the initial treatment for whiplash. 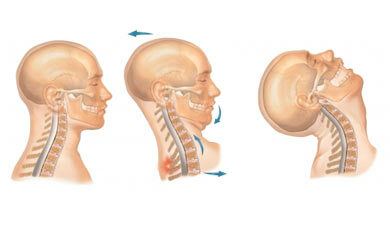 The collar helps to rest the neck, reduces the range of motion of the neck and prevents any additional injuries. However prolonged rest is avoided as this actually slows the healing process. Apply ice pack to the neck for 20 minutes at a time, if possible every hour for the first 24 hours when you are awake. Ice should not be applied directly to the skin. Wrap the ice in a towel and apply on the neck. Mild analgesics like acetaminophen or ibuprofen can be taken for pain relief.